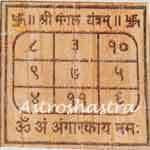 Mangal Yantra for Health, Marriage & Luck in Business and to negate Manglik Dosha. Shri Mangal is worshipped on Tuesday by keeping fast for 11 Tuesday continuously according to rituals. The ladies or gents who are deprived off the marriage even upto 30 to 40 years due to certain obstacles or married life is full of miseries and difficulties, bickings, threatened seperation or divorce, should worship this toward off above evils. Mantra japa and worship is done on this yantras to energize them. Mars does play a vital role, in a female chart particularly, as it is a karaka or significator for husband. Therefore, the affliction of Mars curtails the marital harmony and causes delay. It has been used very successfully to rectify such adversities and also debt-menace. This also protects one from enemies and rivals, and they are defeated. Accidents and conflicts, wounds, operations etc are cured or saved. It is of a triangular shape and it is embossed or engraved over a plate of copper with Gold Plating. Twenty one triangles are made inside a big-sized triangle. Different names of Mars are written in every small triangle. The yantra of Mars should be properly placed vertically for its propitiation. It is energized with Shodashopchar Poojan and red flowers; sweets made from jaggery or rice are to be offered. Also it works remarkably in case of abortions, denial of children, one remains in debt and is not capable to repay inspite of honest intentions rather debt increases making the life hell, all these difficulties can be overcomed by the worship of this Yantra. It helps the worshiper to overcome the above difficulties and one succeds in all his efforts to gain desires and led a comfortable life. When Mars is malefic or one is of rash temprament, it is very useful. One overcomes his enemies, protects from effects of poisonous articles. It shall be kept on rising moon Tuesday, it removes the evil effects of Mars like injury, accident etc. Those who are suffering from high blood pressure and those whose Mars is placed in first, fourth , seventh and tenth house shall keep this yantra at their homes or with themselves to ward off the evil effects of planet Mars on them.
" Om Krung Kreeng Krong sa Bhamaye Namah"
1. Wear Fourteen Mukhi Rudraksha around neck. 2. Daily Recite Hanuman Chalisa. 4. Place Mangal Yantra or Hanuman Yantra in your place of Puja. 5. Perform Hanuman Abhishek on every Tuesday. 6. Wear Red Coarl Gemstone Pendant or Ring. 4. 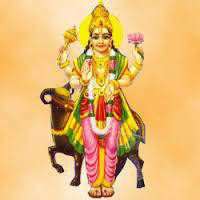 Ruchak Yoga formed by Mars in Horoscope. To know more about your horoscope. To know about the Mars effect on your horoscope .